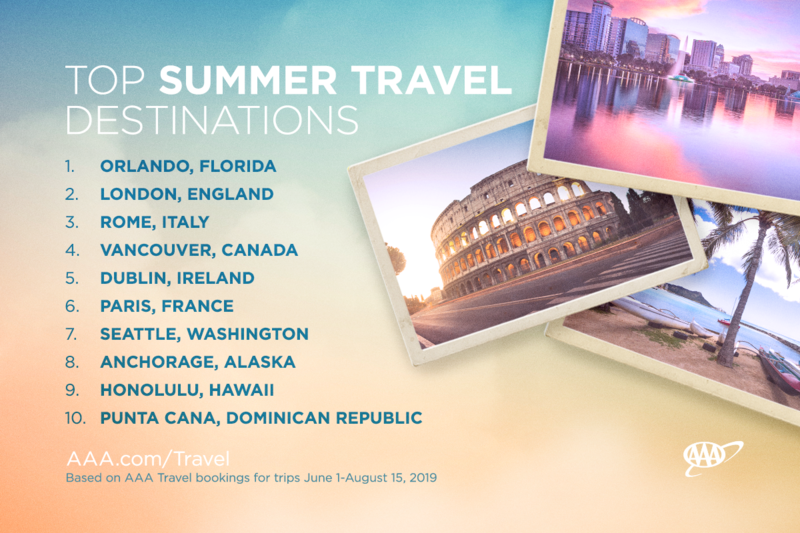 These Are the Places Americans Will Vacation in This Summer - 24/7 Wall St.
About two-thirds of the people who travel for leisure will take a summer trip this year. Many of that 64%, according to the AAA, will leave the United States altogether. Others will go to vacation spots in the United States, particularly theme parks. Ten cities will dominate destinations, the organization reports. Among the top 10 destinations, Orlando is at the head of the list. It is home to Walt Disney World’s four theme parks: Magic Kingdom, Animal Kingdom, Epcot and Hollywood Studios. It is also the location of Universal Orlando, which includes two theme parks: Universal Studios and Islands of Adventure. Three other large theme parks are located in the Orlando area: SeaWorld, Discovery Cove and Legoland. The family destinations cover hundreds of acres and have dozens of hotels. London is next on the list. Recent research showed that the United Kingdom is the most popular country for American travelers. Over 3.2 million Americans went there is 2016. Rome is third on the AAA list, and Italy is the third-most popular country among American travelers. Over 2.2 million U.S. residents went there in 2016. None of the international cities on the AAA list are located in the 28 countries the U.S. government doesn’t want Americans to visit for safety reasons. Vancouver, British Columbia, is fourth on the list. The city is in the westernmost part of Canada and within driving distance north of Seattle. It is the third most populous city in Canada, which makes it the country’s third largest metro area, home to over 2.4 million people. Canada is one of the fastest growing destinations around the world. Fifth on the list is Dublin, Ireland. Almost a million Americans went to Ireland in 2016. After Dublin, Paris is in sixth place. France is the fourth most visited country by Americans. Seattle is seventh on the list. Interestingly, it is geographically close to Vancouver. Visitors to both cities can fly into the Seattle-Tacoma International Airport, one of the largest on the West Coast. Eighth on the list is Anchorage, Alaska, the largest city in the 49th state admitted to the United States, in 1959. Alaska is the largest state geographically by far, covering over 663,000 square miles. Honolulu, Hawaii, the largest city in the 50th state, is in ninth place. In tenth is Punta Cana, Dominican Republic. That was the second most visited country by Americans in 2016, hosting 2.7 million U.S. visitors. It is among the Caribbean Islands closest to the United States. And these are the best hotels there.